On March 3, 2011 OSPR (The Office of Spill Prevention and Response) led a drill adjacent to the Golden Gate Bridge at Fort Baker. 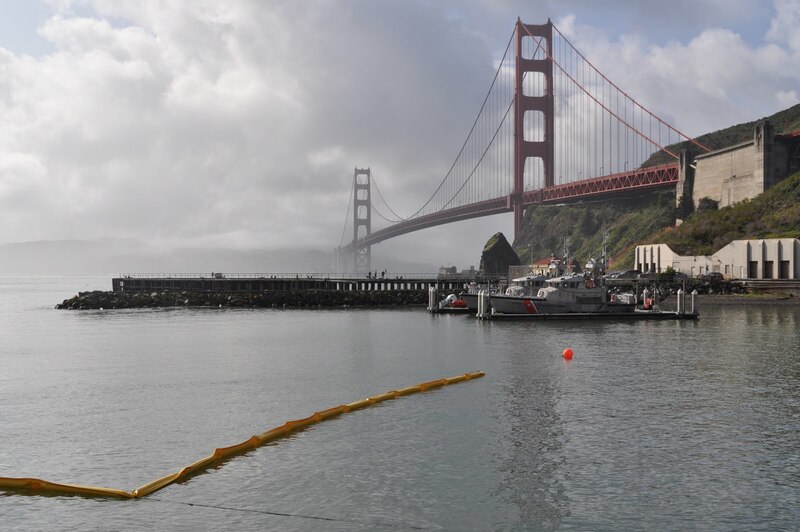 Rice husks were trailed into the water from a skiff to simulate oil, and booms were placed to protect the sensitive eel grass habitat, while allowing access for the Coast Guard Golden Gate’s MLB (Motor Life Boats) rescue boats. Local and State authorities, along with the Coast Guard are actively planning, and practicing their response for the next big spill. Not all sensitive habitats are protected, however, and this is one of the ongoing issues to be addressed. Prioritize the most critical ecological sites for immediate protection. The Area Contingency Plan identifies 232 sensitive ecological sites around the Bay. These sites should be evaluated based on strict ecological criteria to identify which are most critical to the healthy functioning of the San Francisco Bay and coastal ecosystems so that they can be prioritized for emergency response measures. Prepare response plans at the local level. Response agencies at the county and municipal level should develop Local Plans in conjunction with the San Francisco Area Contingency Plan (which governs regional emergency response for the Bay Area). Resources available through local agencies and mutual aid alliances – such as trained staff and cleanup materials – should be inventoried so that they are taken into account and utilized during an emergency response. Prevent a breakdown of communication from state to local agencies. The State Office of Emergency Services should be tasked with notifying and updating the Regional Office of Emergency Services, which should in turn notify and coordinate the activities of local response agencies. Make use of incoming information. The Unified Command (the committee in charge of implementing the Area Contingency Plan in case of an emergency) must actively seek, evaluate and act upon information from the field. This is particularly important in low visibility situations when information from overhead flights is not available. Radio channels used by fishing boats should be monitored by Vessel Traffic Service (an operation of the US Coast Guard, meant to coordinate the safe transit of vessels in the San Francisco Bay) and reported through the Coast Guard to the Unified Command. A hotline for public reports of oil and oiled wildlife should be operational immediately but no later than 90 minutes after a spill occurs. the need to improve the quality of boom that’s available to prevent the spread of oil when a spill does happen.